It's another sublimely built kit from the Echo boys, but you're paying through the nose for standards this high. We think it looks stunning. Superb build. Based up in the north of England, father and son drum building dynasty-in-the-making Dave and David Quinn have brought us some superb examples of what the UK custom scene can produce in the last few years. The company's Apollo series of kits and the plethora of snares that we have seen grace the pages of Rhythm have demonstrated that when it comes to creating metal drums, few are more consistent or prolific than Echo. Today we have another full kit, an attention- grabbing four-piece brass set-up. "You will either think it is a stunning piece of design or you'll see it as downright gawdy"
Let's cut straight to the chase - the look of this kit is 100 percent Marmite. You will either think it is a stunning piece of design or you'll see it as downright gawdy. In this reviewer's opinion it is a beautiful bit of work, and something that shows just what Echo is capable of. 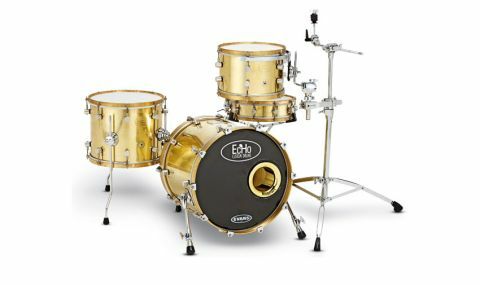 There's certainly a level of class to the kit's aesthetic, the 1.2mm solid brass shells put it well into the refined beauty category and a comfortable distance away from being tacky (this is basically a shiny gold drum kit, after all). The shells have a bright brush finish and in their final production stage have a clear lacquer applied. Once our eyes have adjusted to the sparkling gold finish, the next thing that we notice is the incredible weight. Despite only being an 18"x16" bass drum, this is comfortably the heaviest kick drum we have ever encountered. Seriously, if you're after a kit that you can quickly and easily lug into the back of the car for a gig, this is not it. The toms also carry a sizeable weight to them - we have a 14"x12" floor tom and 12"x8" rack tom. Sticking to the tech specs, the bass drum features 10 lugs while the floor has eight and the rack, six. There is also a snare drum to go with the set, a surprisingly diminutive 14"x4" drum with smart GS007 Trick strainer. "We give the bass drum a hearty thwack and can scarcely believe the almighty thud that greets us"
With the kit set up we give the bass drum a hearty thwack and can scarcely believe the almighty thud that greets us. The 18"x16" sizing always guaranteed that we'd be able to get plenty of punch, but this really does cut through spectacularly. Response is a little more immediate and carries a touch more attack than Echo's aluminum-shelled Apollo kits, but there's also plenty of room for manoeuvre, a quarter turn down and we're able to get a fatter tone, but still with ample amounts of muscle. The rack and floor are every bit as eloquent and versatile in their tonal capabilities. Out of the box the 12" tom has plenty of body to it, packing a gritty, deep punch with the merest hint of ping, while the 14" floor is a powerhouse, a real pocket rocket. The same can be said for the 14"x4" snare. But, whereas the kit has punch to burn, ping is the order of the day here. Without even the tiniest turn of our drum key we're able to get a funky sound from the snare, a well-placed whack to the centre of the drum lets out a shatteringly loud pang. The drum's tone is quick to diminish, and may be a little too dead for some. That said, it's solid, lovingly crafted and won't let you down. But, while it performs admirably, it would have perhaps been nice to have seen this kit bundled with a 14"x5" or 51⁄2" snare, just something that could have given a little more 'oomph' - a sound that would have been more befitting the rest of the kit. Even better, place the 14"x4" to the left as a side snare and stick a 14"x51⁄2" into the set-up as your main snare. Coming back to the sheer weight of the kit, it does make it somewhat impractical. To protect that monster bass drum you will need to get yourself a sturdy hard case, which again adds extra bulk. If you're looking for something that can sit in the studio then this could be a decent choice, but if you want a gigging kit (and with a set-up that looks as stunningly distinctive as this it'd be a shame to hide it away) then this may just be too arduous to shift from pillar to post. It's also not cheap - the four-piece kit comes in at £2,399.